The Iowa Cubs have announced a series of moves to ensure the stability and longevity of Triple-A baseball in Des Moines. Extended their lease with the city to run through the 2037 season. Extended their marketing agreement with Principal Financial Group for another 10 years; through the 2027 season. The stadium will be continue to be known as Principal Park. Extended their Player Development Contract with the Chicago Cubs through the 2020 season. That partnership started in 1981 and is the third-longest active affiliation among minor-league teams not owned by a major-league team. "My partners and I value the Iowa Cubs' relationship with our long-time parent club, the World Champion Chicago Cubs; with our landlord, the City of Des Moines; and with our friends at Principal, whose sponsorship helps us finance the continuing improvements at the park. Principal Park soon will be the oldest park in the Pacific Coast League, but it remains the very best," said Michael Gartner, the chairman and majority owner of the team. "This agreement with the Iowa Cubs will extend our partnership to nearly 40 years since first working together in 1981," said Senior Vice President of Scouting and Player Development Jason McLeod. "We want to thank Michael Gartner and the Iowa Cubs front office for their efforts in creating a top notch destination for our players at the Triple-A level." 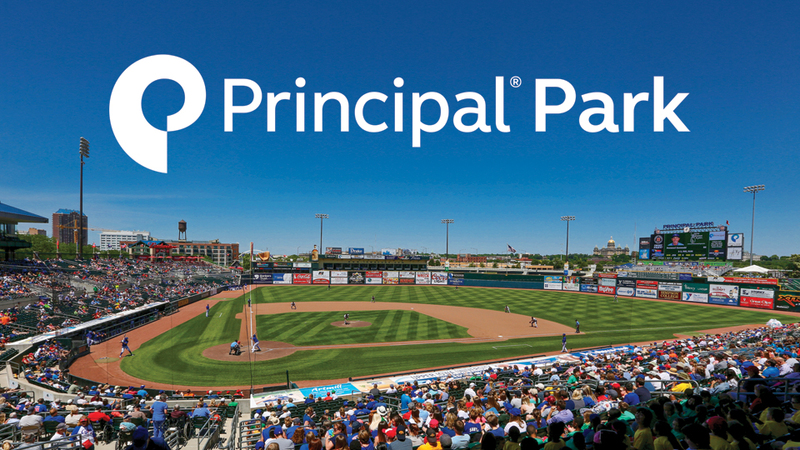 "We're thrilled to renew our naming rights sponsorship with the Iowa Cubs," said Beth Brady, SVP and CMO at Principal®. "Des Moines has been our headquarters for more than 137 years. And we take pride in supporting organizations like the I-Cubs that add so much to the vitality and quality of life in this community that we love." A new high-definition ribbon board has been installed above the left field skybox suites. The digital board will provide additional game information for fans as well as sponsorship opportunities. Free state-of-the-art wi-fi has been added to Principal Park to enhance the fan experience. New LED field lights will be installed in June. The Iowa Cubs are among the first minor-league teams to covert to the new energy efficient lights - which also provide improved visibility for players and fans - designed by Musco Lighting of Oskaloosa. An additional hitting cage will be built in the offseason to bring the player development facilities up to baseball standards.